Yessir, it’s another SlopeCharts improvement. On a Sunday, no less! It may be God’s day of rest, but we chartists never stop going. 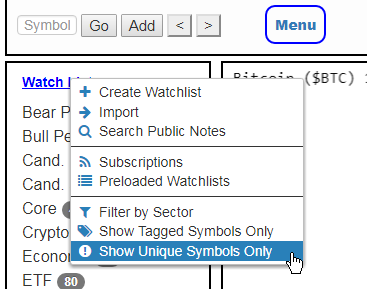 We’ve added a new feature that makes your watchlists only display symbols that are found in no other watchlists that you have. There are several ways this is useful, but let me offer one example. 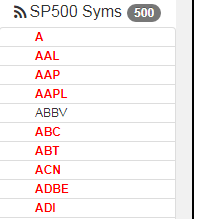 Let’s say you had used SlopeCharts’ “Preloaded Watchlists” feature to subscribe to the S&P 500 list. Obviously there are 500 symbols in that list, but maybe you follow a bunch of those already anyway. And…….voila! 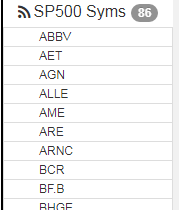 All those boldfaced red symbols (that is, the symbols I had in other watchlists) have vanished, leaving me with a nice manageable list of 86 for me to look at and see if I want to bother following any of those. And so, having demonstrated this, that’s precisely what I’m going to do now.